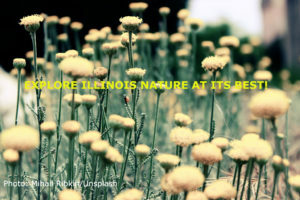 The vast prairie that once covered Illinois is making a comeback of sorts at Nachusa Grasslands Preserve, 90 miles west of Chicago in Franklin Grove, Illinois. This town is also where you’ll find Lincoln Way Inn Bed & Breakfast, making it a perfect place to overnight. Spanning 3,600 acres, Nachusa Grasslands Preserve is a natural area made up of woodlands, wetlands, and a large remnant of prairie. Unusual in its scope, the preserve is a menagerie of plants, birds, reptiles, mammals, insects, and many notable geological features. Nachusa Grasslands Preserve is a large-scale restoration project that is being done in conjunction with the Nature Conservancy to preserve and protect the endangered ecosystem found here. And it is a wonderful place to visit. Home to more than 700 native species, the grasslands is awash in blooms from spring through fall. It’s also home to a bison herd, and offers some terrific hiking. A good first stop when you get here is the Nachusa Grasslands Visitors Center, where exhibits explain the history of the land. Free two-hour public tours of both the Center and the Bison Unit are available on one Saturday a month from May to October, 2018. A special Prairie Festival in September is also a great time to take in guided tours, exhibits, music, art and celebration of the work being done here. To really get the most of Nachusa Grasslands Preserve, take a hike on one of its five trails that lead you through the flowering plants and grasses. The preserve is a haven for birds, with more than 180 species, adding to the natural delights of a walk here. The area is open to hiking year-round, except during controlled burns and shotgun hunting season (check the website for specific dates). Lincoln Way Inn Bed & Breakfast is just a five-minute drive from Nachusa Grasslands and almost feels like an extension of it, with beautiful landscaped grounds and elegant, modern rooms that evoke a rustic sensibility. 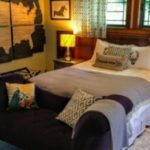 Lincoln Way Inn Bed & Breakfast is a member of the Illinois Bed and Breakfast Association … a unique lodging experience! This entry was posted in Hiking, Historic Sites, Illinois Bed and Breakfasts, Outdoor activities, Touring Illinois and tagged History, Illinois Bed & Breakfasts, outdoor activities by admin. Bookmark the permalink.